I collected Steph from Kingston Park and we headed north for a morning exploring the Cheviot valleys. Along the streams and rivers Grey Wagtail, Pied Wagtail and Dipper were all sitting on rocks or flycatching, Willow Warbler and Chiffchaff were singing and House Martins were gathering mud for their nests as Swallows perched on wires just above our heads and a Rabbit sat, unconcerned, in the cooling shade of an Oak. With temperatures pushing into the 20’s it was always going to be a good day for insects; Wall Brown, Speckled Wood and Red Admiral butterflies were all very flightly in the warm sunshine, Common Blue and Blue-tailed Damselflies added a flash of colour to all of the verges and Green Tiger Beetles were basking on small rocks. A yaffling Green Woodpecker seemed to be mocking us from it’s hidden position before it flew from cover and Steph finally caught up with her bogey bird 🙂 A Cuckoo was calling fom the canopy as a Great Spotted Woodpecker made it’s way from fence post to fallen tree to fence post to tree trunk before finally vanishing deep into the trees and a Spotted Flycatcher was sallying from a high exposed branch. Oystercatchers called noisily, the eerie cries of Curlew drifted across the fells and Red-legged Partridge and Pheasant wandered across the roads everywhere we went. 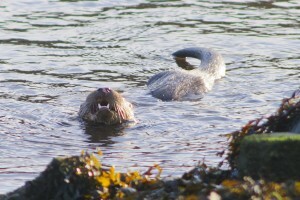 I arrived at Church Point in heavy mist and drizzle, and quickly met up with Sarah and Charlotte, Keith and Maggie, and Stephanie, and we set off for an afternoon and evening searching for Otters around Druridge Bay and southeast Northumberland. I juggled the sites we were visiting, to take account of the weather, but I knew where I thought we should be towards dusk. In the misty, drizzly gloom a Little Egret looked luminous. With warm, humid conditions the air was alive with the sussurating buzz of recently emerged insects. Black-headed and Little Gulls, and swarms of Swifts, were rampaging through the dense clouds of flies as a Pheasant sat motionless in the grass on the water’s edge. Gadwall, Goosander, Mallard, Tufted Duck, Canada Goose and Greylag Goose were all lazing on the water and Common Terns harried a Moorhen that had ventured just that little bit too close to their nest. Grey Herons flew around calling and a dispute over a prime feeding spot broke out between two of these huge birds.